Warning: excessive adulation of Barack Obama is harmful to the vision and can in extreme cases cause hallucinations. We're all familiar with how an Obamania overdose produced strange tingling sensations in Chris Matthews. A new, virulent strain of the affliction has now emerged, claiming its first victim in the person of Bob Herbert, who on live national TV saw visions of the Leaning Tower of Pisa and the Washington Monument where none existed. The NYT columnist, a guest on today's Morning Joe, expanded on the theory set forth in his column of this past Saturday, Running While Black, that the McCain campaign ad mocking Obama as a Paris Hilton/Britney Spears-type celebrity was actually "designed to exploit" racist anxiety about black men and white women. Herbert lumped the McCain ad with the "call me" ad the RNC ran against Harold Ford, Jr. in his Tennessee senate race. It was in describing the McCain ad that Herbert's symptoms surfaced. BOB HERBERT: You guys have seen the ad a number of times, I am sure, and you have it here in-house. First thing you see are a couple of images of Britney Spears and Paris Hilton, right? And we see an image of Barack Obama right after that, comes quickly right at the beginning of the, you remember that, right? Do you remember any other startling images right there at the beginning? HERBERT: Alright. There is an image right there in that very beginning of the Leaning Tower of Pisa, and there is an image of the Washington Monument. Look at the beginning of that ad again. And you tell me why those two phallic symbols are placed there [snaps fingers]—pow!—right at the very beginning of that ad. 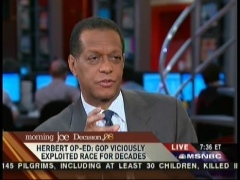 Over the course of the segment, the rest of the gang tried to gently talk Herbert down from his bad trip, calmly explaining that what he was seeing were in fact images of the Victory Column in Tiergarten Park in Berlin, where Obama chose to give his speech. But by the end, Herbert was still speaking of seeing "two phallic symbols." That didn't stop Pat Buchanan from getting off the laugh line of the morning. PAT BUCHANAN: I may be obtuse but I didn't see 'em. When I see Paris Hilton and Britney Spears, I'm not looking at the background! Hat tip NB readers SJ and RG. Note: As FReeper BF has noted, Mika Brzezinski was uncharacteristically quiet during the segment. Abashed on behalf of her fellow Obama fan?